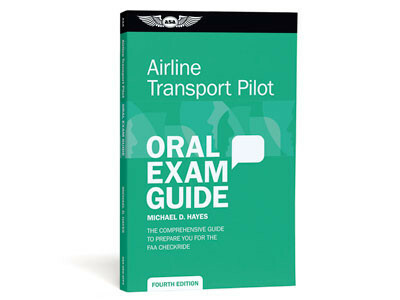 The fourth edition of the Airline Transport Pilot Oral Exam Guide has been updated with new references and new and revised questions to reflect the latest regulations and procedures. A new Appendix, ATP—Airplane Multiengine Applicant Qualifications Job Aid, has also been added. Answers and explanations were researched using FAA documents (and are identified so readers know where to go for further study on any given question) as well as through interviews with a variety of airline pilots, 121/135 operators, and examiners. The ATP Oral Exam Guide teaches applicants not only what to expect, but also how to exhibit subject mastery and confidence when they’re under the examiner’s scrutiny. It identifies the candidates' strengths, weaknesses, and gaps in their aeronautical knowledge, which increases study efficiency. Also by Michael Hayes: Private Oral Exam Guide, Instrument Oral Exam Guide, Commercial Oral Exam Guide, Multi-Engine Oral Exam Guide, Certified Flight Instructor Oral Exam Guide.